Through all the ups and downs during this 2017-2018 NBA season for the Oklahoma City Thunder, people have to remember that this team was constructed in the offseason to compete with the best team in the NBA, the Golden State Warriors. That's exactly what they've done, defeating the Warriors by an average margin of 18.5 points through their two meetings this season; one time in November at Oklahoma City and one time in February at Golden State. More impressively, the Thunder were in the midst of a four-game losing streak heading into their Feb. 6 matchup without their best defender, Andre Roberson. Additionally, the Thunder ran into a huge roadblock in the first quarter after Carmelo Anthony exited the game with a sprained ankle and Steven Adams had to take a seat due to three fouls. The acquisition of Paul George actually did more for Oklahoma City than people thought. George, who's the best two-way player in basketball provides even more length on the perimeter to go alongside Russell Westbrook and Roberson. 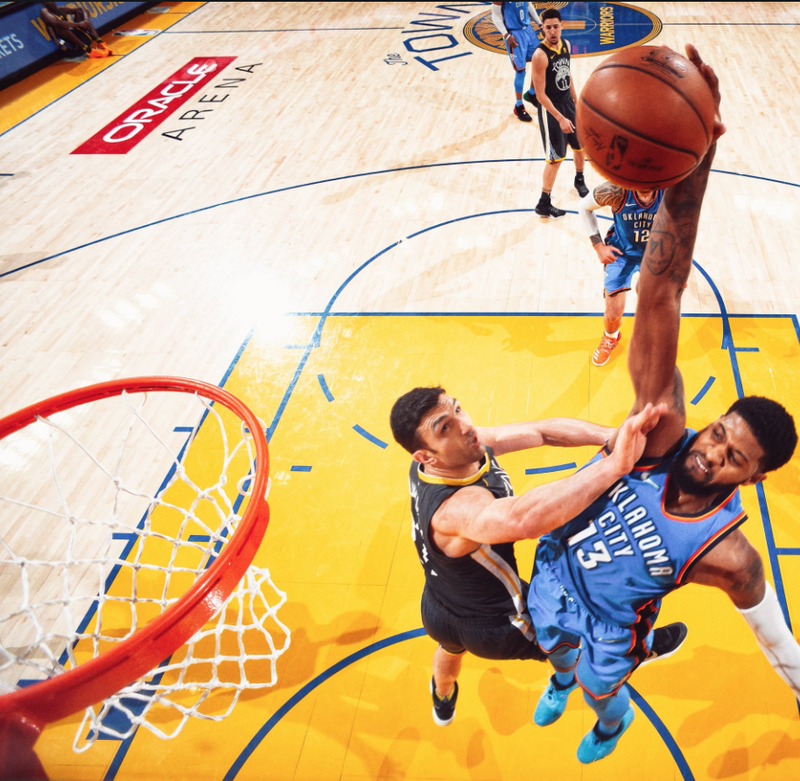 His defense on Klay Thompson was smothering, holding him to 12 points on 38.5 percent shooting and usually when George plays with the level of defensive intensity that he did against Golden State, Westbrook tends to step things up. Tuesday evening Russ did just that by holding Curry to 21 points on 22.2 percent shooting from long distance. On the opposite end of the floor, Westbrook silenced the Warriors' claim that he was easy to guard in the premature stages of the game, knocking down 21 points on 9-of-11 shooting in the opening quarter. Although he slowed down in the scoring department through the remaining three quarters, scoring just 13 more points, he had his way with Curry on both ends of the floor in various ways. George finished the game with a game-high 38 points, 5 rebounds, and 6 steals while Westbrook tallied 34 points, 9 rebounds and 9 assists on 50 percent shooting. Not only did the Thunder dominate offensively and defensively, they out-smarted the Warriors by beating them at their own game. The team from the Bay is known for being a three-point shooting team that can defend and play with that old school physicality the NBA lacks today. Perhaps, that's what makes them the best dynasty in B+NBA history. Billy Donovan and the Thunder was that team tonight. They scored 125 points, shot 38.7 percent from three, muddied the waters inside the paint and ultimately defeated the Warriors in the rambunctious Oracle Arena in the name of emotion and physicality. Draymond Green, who's been Oklahoma City's kryptonite defensively, wasn't a major factor tonight. Actually, Adams, Grant and Patrick Patterson's relentless fight frustrated Green to the core, so much so that he picked up two technical fouls, disqualifying him from the contest. Oklahoma City defeated the Warriors and made it look easy for the second straight time before the NBA All-Star break. Obviously, the playoffs are a different animal but if a team doesn't have the tools to beat another team, it doesn't matter how much history or playoff experience they have, they won't be victorious. It's hard to see where Golden State has a clear upper hand in this matchup. If I was the Oklahoma City Thunder, I'd want to get Golden State out of the way in the second round of the playoffs.